These are the tales of Mr. Sherlock Holmes, a world-famous detective who lives on Baker Street. Â Sherlock cares for nothing but solving crimes, so the task of lionizing him falls to Mr. Watson, a doctor whose awe for his friend is boundless. Â All of the Holmes adventures are catalogued in what is essentially Watson’s diary. 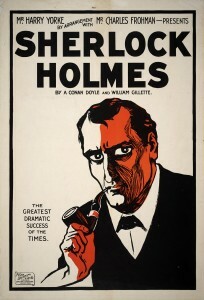 Sherlock Holmes is a drug addict with Asperger’s. Â He is mawkishly attached to his old roommate Watson, and calls him over for tea and opium at any hour of day. Sherlock does all of his best work when he is blitzed out of his skull. Â According to Watson, one hit of opium sends Sherlock into a state of intellectual frenzy, his brain clocking operations at breakneck speed. Indeed, Â one might even say that it kicks into high gear. Â Ha ha. Or he may have simply had a huge head. Â Or he may have suffered from some horrible disease. Â Or his hat may have been too big for him. Sherlock’s astonishing ability to solve crimes is presented as a gift of his intellect, his infinite propensity for logic and deduction. Â In fact he is simply the luckiest man alive: Â his fantastic hunches are always correct. Â His real gift is ESP. Sherlock’s substance abuse and supernatural intuition are irresistible but well-worn jokes, and I’ll stop making them right now. Â Candidly speaking, the stories are incredibly entertaining. Â Most of them are first-rate – taut, well-written, and genuinely suspenseful. Â Holmes is a great character – or caricature – and Dr. Watson is the quintessential sidekick. Â I particularly enjoyed “A Scandal in Bohemia” (which features the very compelling character Irene Adler) and “The Red-Headed League”. If you are in the mood for some nineteenth-century adventure, quirks and quips from the original eccentric Englishman and a bit of heroin, I absolutely recommend Sherlock Holmes.